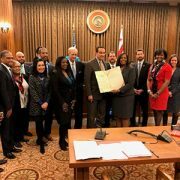 Dr. Jackson and colleagues from Children’s National Health System and the District’s Multidisciplinary Team join resolution sponsor Councilmember Vincent Gray and the D.C. City Council for the presentation of the Child Abuse Prevention Month Recognition Resolution of 2018. He mentioned the many years that the District of Columbia fell in the top five for child abuse victims per capita, and that, while the city still ranks highly, the number of victims per 1,000 children has declined significantly since 2009. He attributes this decline to the communities and agencies who work together to protect children and strengthen families. Allison Jackson, M.D., MPH, chief of the Child and Adolescent Protection Center at Children’s National, expressed her sincere appreciation for all the people who care for and protect children. The Child and Adolescent Protection Center at Children’s National Health System was started in the mid-1970s to provide medical care, forensic medical evaluations by pediatric trained forensic professionals, and mental health treatment for children. Dr. Jackson notes that in the 1990s, the District established a multi-disciplinary team to implement the trauma-informed response framework across all agencies in the District addressing these issues. She also cites that years of research into adverse childhood events have shown that childhood abuse, exploitation, and neglect has long term medical and brain health consequences that last throughout life and can shorten lives, as well. However, that research also shows that trauma-informed care and interventions can reduce the exposure to maltreatment, and also reduce the long lasting impacts of maltreatment on a child. 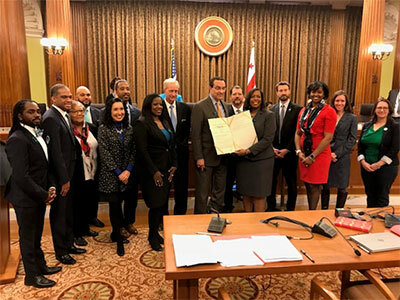 The presentation occurs at 33:00 minutes of the 22nd Legislative Meeting of the D.C. City Council.